March 24, 2018 at 7:30 p.m.
American pianist THOMAS PANDOLFI is an exciting virtuoso who, with each passing season, is becoming more and more sought after by audiences worldwide, and showered with superlatives by critics for his passionate artistry and amazing technique. His orchestral appearances often feature not only the beloved masterpiece concerti by Tchaikovsky, Rachmaninov and Liszt, but also the equally brilliant ones by Paderewski, Rubinstein and Moszkowski. Additionally in the “Pops” genre, Thomas’ critically acclaimed performances of Rhapsody in Blue (Gershwin), Concerto in F (Gershwin), Warsaw Concerto (Addinsell) and the James Bond Concerto (Proctor) are immensely popular. Among his engagements during the 2015-16 season, were as guest soloist with The National Philharmonic, Ohio Valley Symphony, North Charleston Pops, Cheyenne Symphony, Maryland Symphony, Alexandria Symphony, Symphonicity, Amadeus Orchestra, McLean Orchestra and Frederick Symphony. During 2016-17, he will also be guest soloist with The Paducah Symphony, The Charlotte Symphony (FL), The Washington Metropolitan Philharmonic, The Amadeus Orchestra, The Tiraspol Philharmonic, The Alexandria Symphony, and The Maryland Symphony at The Garrett Lakes Arts Festival. April 28, 2018 at 7:30 p.m.
American soprano Risa Renae Harman, as noted by The New York Times, “is that rare creature among singers, a really good recitalist.” A versatile singer who navigates a wide range of repertoire, she has appeared as soloist in Samuel Barber’s The Prayers of Kierkegaard at the Kennedy Center with The Washington Chorus, Beethoven’s Missa Solemnis with The Philadelphia Singers at the Kimmel Center and Alice Tully Hall, Handel’s Laudate pueri with The National Cathedral Choral Society, Mozart’s Exsultate, jubilate at the Kennedy Center, Verdi’s Requiem with The Oratorio Society of New Jersey, Bach’s Jauchzet Gott in allen Landen, BWV 51 with The Great Lakes Chamber Orchestra, and solo recitals at the Brooklyn Library and the acclaimed Trinity Church. Recent engagements for Miss Harman include Handel’s Messiah and Saint-Saëns Oratorio de Noël, Op.12 with the Great Lakes Chamber Orchestra, her portrayal as Jenny Lind in Jenny Lind, The Swedish Nightingale in America, a play with music by Kelly Hale, soloist with the Huntington Chorale Society in Dvorak’s Te Deum, Vivaldi’s Gloria and Mozart’s Vespers. Operatic performances include The Queen of the Night in Die Zauberflöte, Zerbinetta in Ariadne auf Naxos, Adele in Die Fledermaus, Violetta in La Traviata, the title role in Lucia di Lammermoor, as well as creating the role of Louise in the world premiere of William Schuman’s A Question of Taste for Glimmerglass Opera. She has appeared with New York City Opera, Fargo-Moorhead Opera, Lake George Opera, and Lyric Opera Cleveland. Join The Ohio Valley Symphony for the 28th Season featuring 5 exciting concerts in our home, the historic Ariel Opera House. The season kicks off with featured soloist, violinist David Kim on September 9. The Ariel will be filled with the exciting sounds of The Ohio Valley Symphony presenting Scherheraze on November 4th. Get ready for the holidays with the ever popular and ever favorite The “Christmas Show” on December 2nd! Be sure to order extra tickets for your friends and family — this one sells out quickly! Spring 2018 brings pianist Thomas Pandolfi to the stage on March 24. We wrap up the season with the sweet sounds of “Love Songs” with soprano Risa Renea Harman on April 28th. September 9, 2017 at 7:30 p.m. 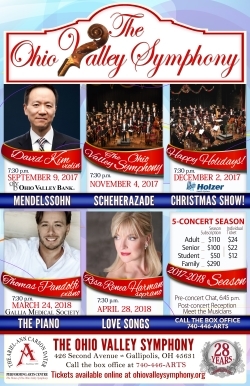 Highlights of Mr. Kim’s 2016-17 season include appearing as soloist with The Philadelphia Orchestra under the baton of Music Director Yannick Nézet-Séguin on their summer tour of Asia; adjudicating at the Stulberg International String Competition; teaching/performance residencies at Bob Jones University, Grove City College, Messiah College, Roberts Wesleyan College, and Rice University’s Shepherd School of Music; continued appearances as concertmaster of the All-Star Orchestra on PBS stations across the USA and online at the Kahn Academy; recitals, speaking engagements and appearances with orchestras across the United States; and the annual David Kim Orchestral Institute of Cairn University in Philadelphia where he is also a Professor of Violin Studies. He has recently been appointed as Distinguished Artist at the Robert McDuffie Center for Strings at Mercer University in Macon, GA and will begin making regular teaching visits there in the fall of 2017. In December, he appeared as a special guest at Keith and Kristin Getty’s “Irish Christmas” Concert at the Kimmel Center for the Performing Arts in Philadelphia.